It has never been a myth that leather jackets are more trendy and stylish as compared to other material jackets. They are more of a shiny texture and glaring appearance. And what that jacket is of exquisite red color? Then, of course, it would be much shinier and more exotic to wear. Jackets Inn never leaves its customers disappointed and always have some brilliant dressing and fashion ideas. We offer Deadpool shiny leather jackets, inspired by his character costumes in the movie. Deadpool was first introduced as a fictional character by Marvel Comics, an American comic books publisher. He was a mutant and was depicted as a supervillain character. Since he has never been through much fame, therefore, this depicted image didn’t clear, until 2016, when his own movie was released, where he was finally cleared off like a superhero. Due to his tendency of making jokes continuously, he gained recognition within a short span of time. His cool outfit was highly appreciated and praised by critics as well as fans and became a choice of fashion rapidly. Today, the red outfit of Deadpool is in huge demand and every person loves to wear it and feel the comic and intellectual power of the character within him. Now it is not a dream anymore, Jackets Inn offers a wide range of Deadpool jackets to the fans at reasonable prices. 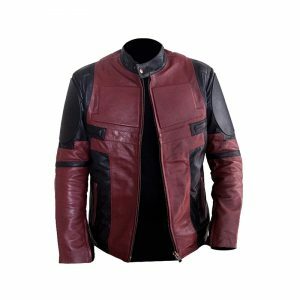 We have Deadpool biker faux leather jacket, waxed faux leather jacket, maroon & black faux leather jacket, shearling red jacket and many more. All the jackets are made of genuine material with premium quality accessories to it. We believe in delivering what we promised, never sending you cheap quality fabrics and torn pieces. Order now to believe in the exceptional quality we offer.